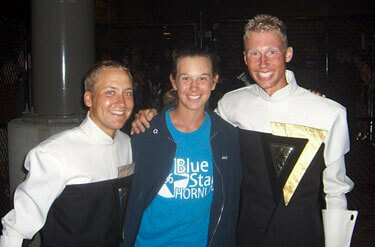 Lindsey Schueller, a 2006 member of Blue Stars, sent this picture. This is a picture of me and two of my drum instructors from my high school marching band. This picture was taken immediately after the ageout ceremony at the 2006 Drum Corps International World Championships. The 2006 season was their ageout year as well as my rookie year. Jimmy York (left) and Doug Downer (right) were with the Glassmen snare line. This summer was my rookie year as part of the Blue Stars' euphonium line. It was nice to see both of them occasionally on tour. It was great for me to march in 2006 with them because they both introduced me to drum corps and helped me keep pushing all throughout the season.